Our aim is to be the premier tennis academy in Singapore providing the best tennis lessons and tennis coach in Singapore. Covering both kids tennis classes and adult tennis classes, our goal is to deliver professional, high quality tennis programs that incorporate the latest developments in game techniques using our own holistic teaching approach. We do this by maintaining an interactive and fun environment for players, whether it be in group tennis lessons or individual tennis lessons. Since its inception, Future Sports Academies has been delivering first-class tennis programs from various locations around Singapore, including clubs and top schools. We run a range of tennis programs for every age and playing level; namely, ladies clinics, corporate team building, and group coaching for kids while managing a wide range of social and competitive events for our clients. We offer trial tennis lessons for all our courses - come, enjoy, and decide if you want to keep on playing! After your trial, you will have the choice between signing up for a private tennis lesson or group tennis lesson with us in on of our various locations across Singapore. For group sessions, we always keep a maximum of 6 players in our tennis classes, to ensure players can gain the most from every session. Private tennis classes are tailored specially for the respective clients. Whether you are looking for tennis lessons for yourself, friends, kids or team, we will have a program for you. 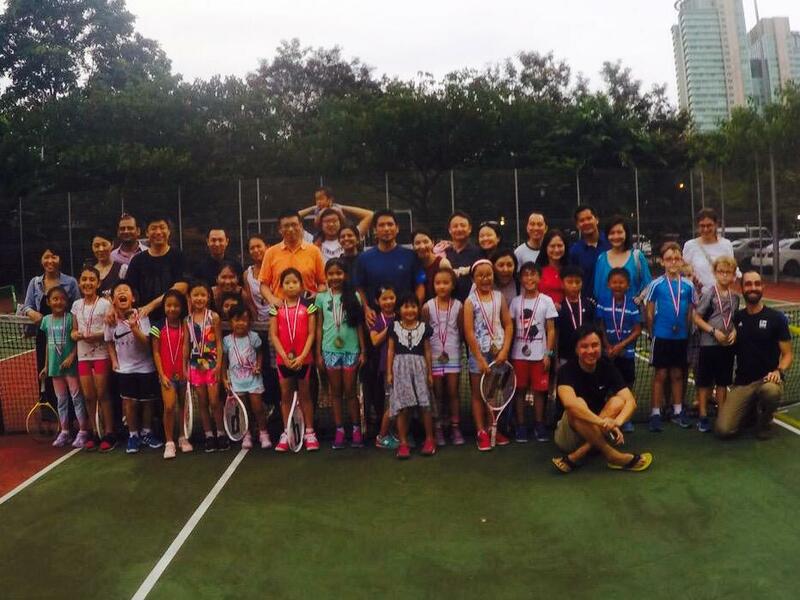 Our main goal is to ensure high-quality tennis coaching in Singapore while you have fun and spend an enjoyable session where you will look forward to coming back to every week. Tennis camps in Singapore are also organised periodically for adults, juniors, and high-performance juniors. We are able to organise personalised adult tennis clinics for corporate clients as well, at your request – based at your preferred location (even at your office space), we can customise a tennis program anywhere around Singapore. You just got to ask us! Rather than rely on an uninspired standard approach that does not address the needs of everyone, our tennis programs are customised to suit the needs and goals of participants. By learning and exercising in a dynamic, enjoyable and vibrant environment, players can look forward to continual improvement while retaining a high level of motivation. Start with a Singapore international tennis academy that provides first-rate tennis instruction for all ages and playing levels today! We provide flexible scheduling options for those who have a busy schedule they have to work around. Our tennis coaches in Singapore are available for you before and after regular office hours, as well as during the day and lunch breaks. We will always do our best to accommodate your needs! The tennis coaching team at Future Sports Academies comprise of professional tennis coaches in Singapore who strive for the highest standards in teaching. Each pro tennis coach is certified to teach tennis locally and overseas and has years of professional experience they learn from. As tennis is a sport that is ever-changing and about growth, our tennis coaches in Singapore strive to be better each day. Through much discussions within the team and by attending workshops and conferences worldwide, you are assured of a dedicated and knowledgeable experience with us at Future Sports Academies. We offer a wide range of locations to choose from, on all corners of the island. Choose the most convenient one and we will get you a spot in one of our group tennis classes or book a court for a one on one tennis lesson with your favourite personal tennis coach in Singapore. We can also come to your condominium or apartment if a tennis court is available there. Call +65 9852 8773 or email us at tennis@futuresportsacademies.com to book a tennis coach in Singapore or reserve a slot in one of our group tennis classes and join the Future Sports Experience now!